Nearly forty-percent of Catholics attend Mass monthly or more often. Although this is a discouraging number, given the essential place the Mass has in Catholic life and discipleship, it offers encouragement in one clear way: four out of ten Catholics can grow as missionary disciples because they are nourished and sustained by the celebration of the Mass. In fact, the Mass provides a necessary foundation for growing as followers of Jesus Christ and finding the resources to live and share faith more clearly. It does so because it grounds Catholic spiritual life on the Word of God and the shared Sacred Food in which Jesus gives himself to his followers and to the world. While this has always been implicit in Catholic life, the Second Vatican Council helped to make these elements of formation and grow much more explicit for virtually every Catholic. The beautiful and ancient ritual of the Mass (which had evolved slowly century by century) was opened up for God’s people to relish more clearly than ever. Not only was the Mass put into the“language of the people”; even more, the structure of the Mass was clarified before the eyes of all participants. Whereas the Mass celebrated in Latin couldlook like one unbroken and mysterious rite, the Second Vatican Council helpedCatholics to see the Mass in the two major moments of its ritual. The Eucharistwas composed of the “Table of the Word”; and the “Table of the Eucharist.” Eachof these Tables is necessary to feed Christ’s disciples. Each of these Tables also provides the foundational elements of being missionary disciples—being converted by the Word of God and being strengthened by the Bread and Wine that Jesus gives his friends. The first part of the Mass celebrates God’s Word proclaimed to the congregation. “Celebrate” may sound a bit overdone, but when we consider how the Word is proclaimed in a formal way before the congregation, we certainly are proclaiming its decisive place in our lives. We do not come to Mass to read our own bibles, or to shut our eyes and individually meditation. Welcome to Mass so that God’s Word can be addressed to God’s people, to a community of faith that stands bound to the Word of God because we have heard that Word together, an invitation and challenge to each and all of us. What goes through our minds as we hear the Word of God? Well, if we are honest, probably lots of things go through our minds as the Word is proclaimed simply because our minds tend to run this way and that way with various association we make—tasks to do, people we worry about, pains we may have. In spite of these natural distractions, enough of the Word becomes clear to us as we hear the stories and sayings of those whom God chose to use toreveal God’s love to the world. As these images enter our ears, they begin to shape our lives. None of this happens instantly, for the most part, but gradually we hear of the way people from ancient Israel learned of God’s presence, came into dialogue with God, committed themselves to God, and went through a full range of experiences as they sought to be faithful to God. We also hear of the followers of Jesus who communicated the fresh impact of Jesus’ presence in their lives, and who struggled to understand what it meant to be a community of the “new and eternal covenant,” in which all humankind, whether Jew or Greek, whether rich or poor, could find a place at God’s table. When we stand to hear the Gospel, it’s as if Jesus himself were present, speaking his words to us. Over the years, the scenes ofChrist’s deeds and the array of his words become part of the mental imagination from which our thoughts and actions arise. We stand to attend to Jesus more fully; we stand to affirm our desire to be shaped by the Word of God as Jesus speaks to us through the Gospels. Jesus tells us how to be “blessed,” and find happiness through trusting in God. Jesus speaks parables that jag our thinking,forcing us to work along with his speech. Jesus reaches for the outcasts and the seemingly unforgiveable, showing us how God truly relates to us. Jesusreceives the adulation and the opposition of those who hear him. We see theopposition virtually win, until Jesus rises from the dead, reversing the shameof Crucifixion and breaking reality open by sending the Holy Spirit. Every proclamation of the Word is teaching us language to speak with God and listen to God. Every event we hear challenges us about our own choices in terms of God. Every healing speaks to our hurt; every embrace narrates our own isolation, now overcome by God’s love. Everything we hear inthe Word frames God’s essential question to us (Do we believe? Will we trust? Canwe accept?) and teaches us a way to begin responding. How do we think of God? Have we grown in our relationship with God? Are we able to grow in trust, hope, and prayer? Have we formed a friendship with Jesus? Do we want to know him more? How has Jesus touched me? How has Jesus saved me, given me his Spirit, and welcomed me into his Church? How can I speak of Jesus to others? 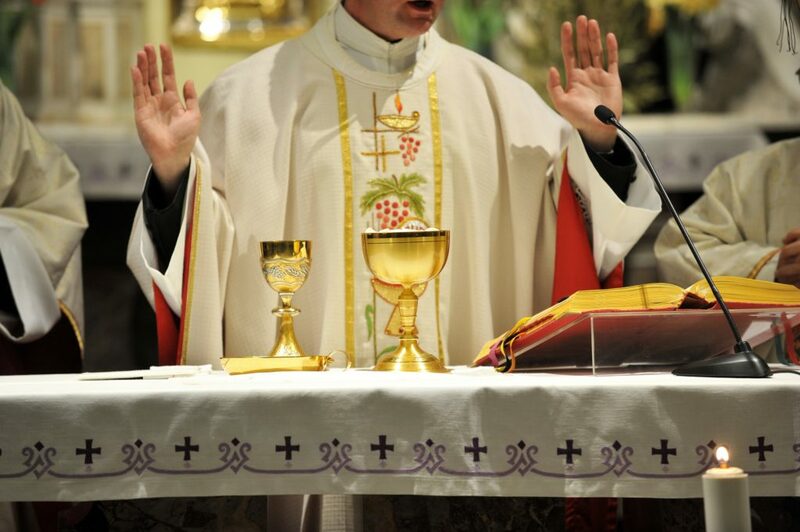 The Liturgy of the Word prepares us for the second part of the Mass, the Liturgy of the Eucharist. Before 1965, almost all our attention as Catholics would have been on the Consecration which is a key part of this part of the Mass. Now, however, we can see this whole part of the Mass as one central prayer in which we offer God our gifts and, as we praise God, offer ourselves with Jesus in service to God. This includes receiving Holy Communion and being sent forth into the world as a renewed follower of Jesus. This part of the Mass flows from the Liturgy of the Word because, after we have seen how God’s love comes to us, we respond with the deepest prayer we can muster, prayer in Jesus, prayer in thanksgiving, prayer with my fellow disciples. Sometimes we wonder if we have ever said “Yes” toGod. Every time we celebrate Mass, this is exactly what we are doing as we unite our prayers with Jesus’ unending prayer. Jesus is our eternal priest, offering himself to the Father; our prayer is to offer ourselves with him. We should notice just how much the celebration of the Eucharist reinforces our sense of discipleship. A disciple follows Christ and makes him the center of one’s life. Sometimes discipleship seems exciting and very consoling; sometimes discipleship seems stale and dry. However we are feeling, we unite ourselves to Christ who leads the way and lets us accompany him. Jesus can take all of us at Mass, however we might be feeling, and unite us to him. Parish is where we come as a community and, offering ourselves withChrist, become united in him and in the Holy Spirit. First, we offer our gifts as a sign of offering ourselves. Next, we join ourselves with the priest as he invites us to lift up our hearts and give thanks to God. After this, we say the prayer that Jesus gave to his disciples as we prepare for HolyCommunion. We exchange peace with each other because it is as one community that we come to partake in the one meal of Jesus. The congregation processes forward then to receive Holy Communion, the highest expression of union we can have with Jesus and, through Jesus, with God in the Spirit. We make his Flesh our flesh, and his Blood our blood. 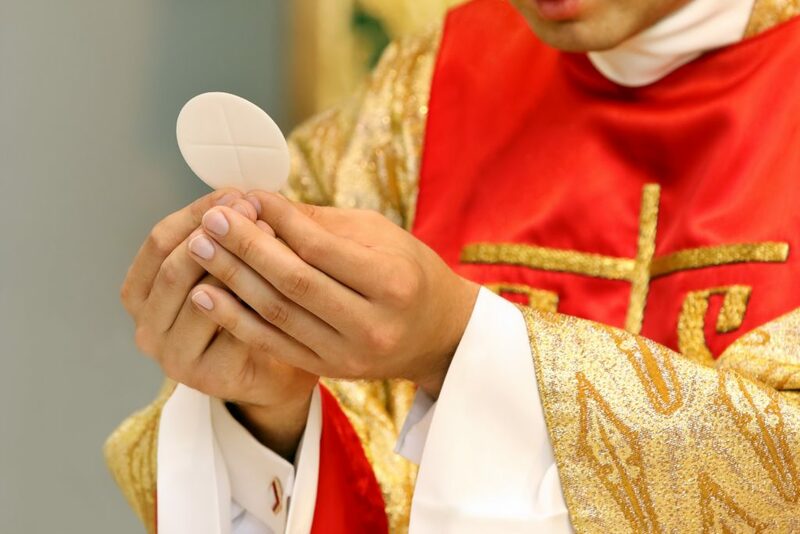 We Catholics do not see this only as something symbolic; we see it this as our becoming one with the Real Presence of Jesus Christ, whose Spirit transforms our bread and wine into Christ’s Body and Blood, and transforms us to be more fully Christ’smembers. I give myself and my resources to Christ to build his Kingdom. I praise and thank God for the gift of his Son in the Holy Spirit. I unite myself with Jesus’ self-offering. I become one with Christ by pledging to live his life in my daily life. I accept the charge to spread the Good News of Jesus in the world. Because the Mass involves ritual—patterns of actions and words—it can seem pretty formulaic. But once we see what the Mass is doing and saying, then we realize that we are well beyond formulas. The Mass affirms who we are in Christ, and it supports us as followers of Jesus. In one sense, the very act of worshipping at the Eucharist accomplishes Christ’s mission because we are sent forth as witnesses to Christ who has united himself to us. In another sense, the Eucharist seeks to accomplish so much more because it promises God’s salvation and moves us toward the fulfillment of the Kingdom when we will forever rejoice (that is, experience God’s joy) in heaven. After we have participated in the Mass, we become more fully agents of the Kingdom, seeking and bringing about that ultimate state when “God will be all in all” (1 Corinthians 15:31), and all will be one in God.